NASA's Opportunity rover has roamed more than 26 miles across Mars over the past 11 years – and now you can watch its epic journey in just eight minutes, thanks to a time-lapse video released by the space agency. The time-lapse documents Opportunity's marathon across the Red Planet with a series of images captured by its cameras between January 2004 and April 2015. The footage allows viewers to feel like they're in the driver's seat, as the rover bumps along the rough terrain and explores its surroundings. The video even has its own soundtrack, created from vibration measurements taken on its journey. Loud noises indicate the ground was rough beneath its wheels. Quiet sounds mean the terrain was smooth. If you pay close attention, you'll see the rover get stuck in a sand dune for two months in 2015. You'll also witness it revisiting its deflated landing craft and examining its own discarded heat shield. But Opportunity has investigated more than its own components. In fact, it examined the first meteorite found on another planet and found evidence that water once flowed across Mars. It's not a bad list of achievements for a rover that was initially designed to operate for only 90 Martian days (a Martian day is around 40 minutes longer than an Earth day). “...Anything could fail at any moment...it’s like you have an aging parent, that is otherwise in good health — maybe they go for a little jog every day, play tennis each day — but you never know, they could have a massive stroke right in the middle of the night. 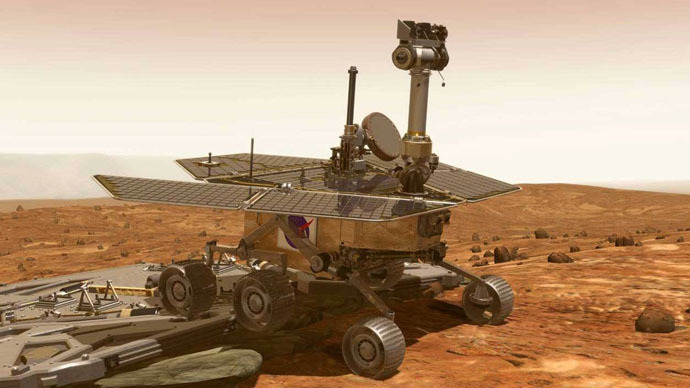 So we’re always cautious that something could happen,” Opportunity project manager John Callas told Discovery News in December. But the rover is keen to continue its journey for now, preparing to drive into 'Marathon Valley' – named after the rover's 26-mile distance milestone. NASA expects the valley to have areas of exposed clay, which should give new evidence about exactly when water flowed on Mars. Meanwhile, NASA is currently designing a new rover, which it hopes to send to Mars in the future, possibly as soon as the 2030s.